My active lifestyle has led to many broken phones over the last five or six years. Because of this experience, I went a long time opting for the cheapest (and by proxy the most easily replaceable) phone available whenever I needed a new one. I failed to realize, however, that I could choose a nice phone as long as I invested in protecting it. Enter my choices for the best waterproof phone cases. When I’m guiding kayak or hiking trips during the summer in Lake Tahoe, I have to know that my phone is protected against the elements. While I recommend that most of my guests leave their phones behind before we get out on the lake, I have to bring my phone along as an important safety measure. For this reason, I’ve become very familiar with the methods for protecting my phone against water. The brands I’ve chosen for this article give you options at various price ranges so that you can choose the best waterproof phone case for your needs. 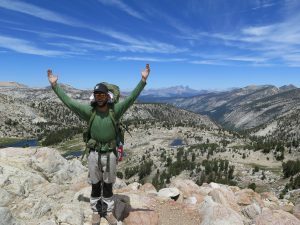 Side note: If you’ve already protected your phone and you’re interested in other product reviews, be sure to check out my Outdoor Gear and Backpack Reviews pages for reviews on water filters, tents, hiking shoes, trekking poles, and backpacks from brands like Kelty, REI, Gregory, and more. Also, check out my Tips and Trails page for more hiking tips and trail recommendations! The following two phone cases are the ones which I put into use on the most frequent basis. The first is my go-to choice for 24/7 phone protection. The second is what I turn to when I feel that one layer of protection is simply not enough. Later, I’ll discuss a few additional phone cases that have received positive reviews, but that I don’t have personal experience using. The LifeProof FRE is my waterproof phone case of choice. I personally rely on this case to protect my phone at all times. The only time I remove my phone from its case is when I have to change the SIM card if traveling abroad. The FRE offers true 360-degree protection and includes a built-in screen cover to keep your phone from being scratched or shattered if dropped. The case is submersible down to 6.6 feet for up to one hour and is also sealed from dirt, dust, and snow. It was important to me to find a waterproof phone case that didn’t add a bunch of extra bulk to my phone’s overall size, which is precisely what the FRE offers. Unlike some cheaper cases, this case integrates seamlessly with your phone and retains full access to buttons, cameras, and other controls. The FRE is available in various sizes for different phone models and features an IP68 waterproof rating. In terms of retaining audio capability, the case actually comes with front-facing audio ports that can be sealed when not in use. This guarantees that the ports keep their function and dirt, grime, and water stay out. I’ve heard stories of a phone in a Lifeproof case washing ashore after being dropped overboard. I don’t recall how long the phone had been submerged, but in the story I heard it still retained its function after being removed from the Lifeproof case. While I don’t plan to test my Lifeproof case in any such manner, I know that it has already protected my phone from unexpected kitchen spills, beach sand, and splashes over the side of my kayak while photographing guests. In addition to my Lifeproof case, I like to double up on phone protection while kayaking. I trust the safety of my phone to the bomber durability of a Pelican Micro Case. These cases are available in a wide variety of sizes, depending on your phone or other gear you want to keep inside. For kayaking trips or other water-based excursions, these micro cases also give you a safe place to store keys and a wallet while you don’t need them on the water. These Pelican cases meet IP67 waterproof testing parameters and can be submerged down to one meter for up to 30 minutes. In addition to being watertight, they are also crush proof and dust proof, which means you can throw them in a dry bag with a bunch of other gear and not worry about their contents being squished. These cases offer a unique feature that you won’t find in many other waterproof phone cases. They contain an automatic pressure equalization valve that balances the interior pressure and keeps water out. If you do lose this case overboard and it sinks (which they usually don’t because they have air inside of them), the contents won’t be damaged by changing pressure underwater, as well as being protected from the water itself. 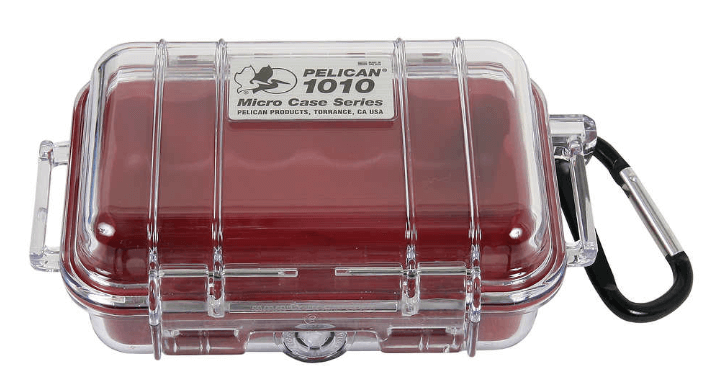 The Pelican Micro Case is designed with stainless steel hardware and includes a rubber liner that protects your phone and doubles as an O-ring seal. I love the usability of these cases because they include a carabiner that I can clip directly to my dry bags or to the seat of my kayak. This allows me to keep my phone and other valuables easily accessible without worrying about them being damaged when the winds kick up and waters starts spraying over the gunwhales of my kayak. Finally, each micro case is backed by Pelican’s Lifetime Guarantee of Excellence. Although I don’t have direct experience with any of these cases, they’ve come recommended by many sites online, such as Lifewire. Because I recognize that the two cases I utilize might be a little higher on the price scale (don’t forget you get what you pay for! ), I’ve provided a few other options to choose from. 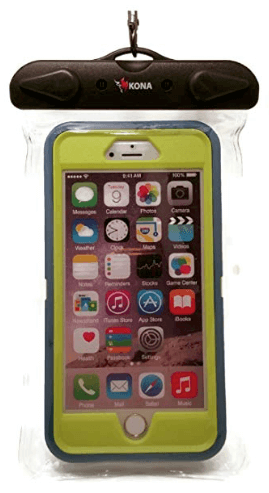 The Catalyst waterproof phone case has been recommended as the best case for iPhone users. These cases are rated IP68 and have been field tested to retain their waterproof ability when submerged down to 33 feet. They also meet a MIL-STD 810G standard rating for drops from heights up to 6.6 feet. The cases themselves are made of a rugged, scratch proof polycarbonate and finished with a light silicone material. 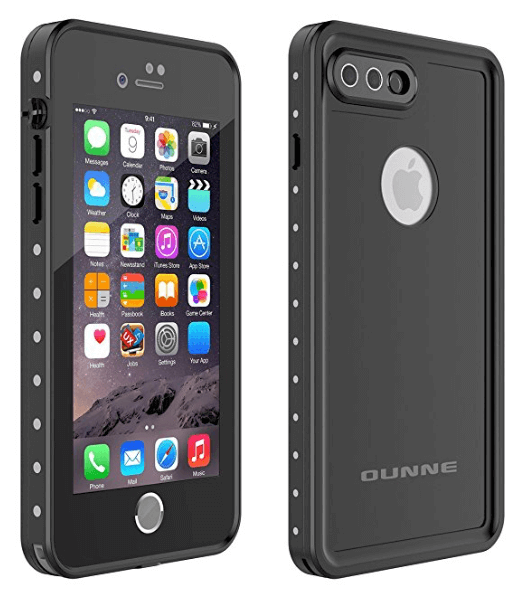 The Ounne waterproof phone case receives professional certification of IP68 and has been tested to withstand submersion down to 10 feet for up to two hours. It is also snow proof, dirt proof, and tested to stand up against drops from heights up to 6.5 feet. The case uses TPU material with a solid, durable frame to protect your phone and the screen display maintains touch ID function, home button sensitivity, and sensor capability. The Kona Submariner is a universal waterproof phone case that function with many phone models and sizes. It’s a top-sealing, see-through case that protects your phone from water to depths as deep as 100 feet. It also protects your phone from dust, mud, grease, and other contaminants and has the added benefit of floating when you seal a bit of air inside along with your phone. If you’re a kayak guide or a very active outdoor enthusiast, there’s a high likelihood that you’ll want the degree of protection provided by cases like the Lifeproof FRE and the Pelican Micro Case. However, if you’re a casual hiker or occasional kayaker, you might not feel like you need to spend top dollar on a waterproof phone case. In this brief Buyer’s Guide, we’re going to talk about some important factors to consider when choosing the best waterproof phone case for your needs. Let’s take some time to explain IP rating and talk about why it’s important. IP stands for “Ingress Protection” (sometimes also “International Protection”). A device’s IP rating almost always consists of two numbers. The first number tells you the device’s rating for ‘solids protection’ and the second tells you it’s rating for ‘liquids protection.’ In the case of waterproof phone cases, the latter is more important, but it’s also useful to know how well the case will protect your phone from dirt, dust, and other solid debris. It’s important to know that the numerical rating a device receives indicated its level of protection against access to a device’s “hazardous parts.” In other words, the enclosure may not keep every speck of dirt or droplet out water from touching your device, but a higher rating means less likelihood of your phone receiving “harmful” exposure to the elements. Your choice of phone will largely dictate the best waterproof phone case for you. While many case manufacturers work hard to provide variations in their designs to suit a variety of phone models, some place more focus on certain phone types than others. For example, I find that my Lifeproof FRE waterproof case fits perfectly with my Samsung S9+, but I know folks who have purchase the same case for an iPhone and found less than optimal functionality once it’s installed. Fortunately, it’s not too hard to find a more thorough breakdown of the best waterproof phone cases for specific phone types. It’s probably common sense that a full-time kayak guide is going to need a higher degree of waterproof protection than the casual kayak day tripper. When choosing a waterproof phone case, keep in mind how you’ll primarily use it. 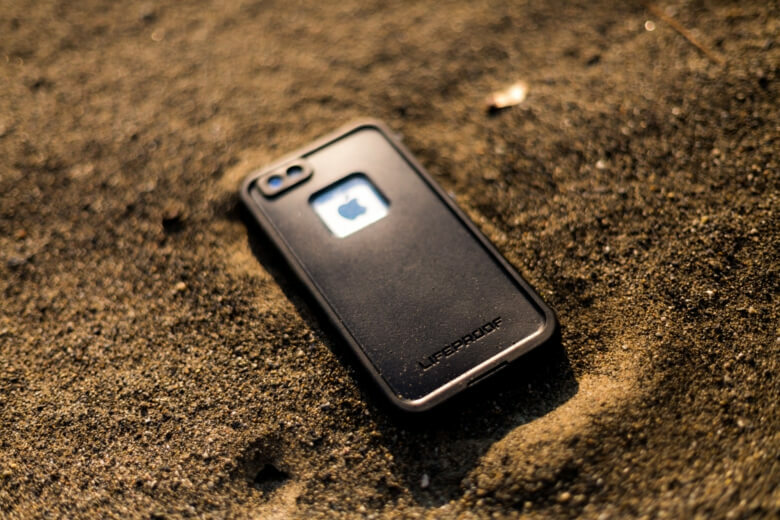 If you want your phone in a case that provides 24/7 protection against water, dust, dirt, and other debris, you’ll want a case like the Lifeproof Fre, Ounne, or Catalyst. 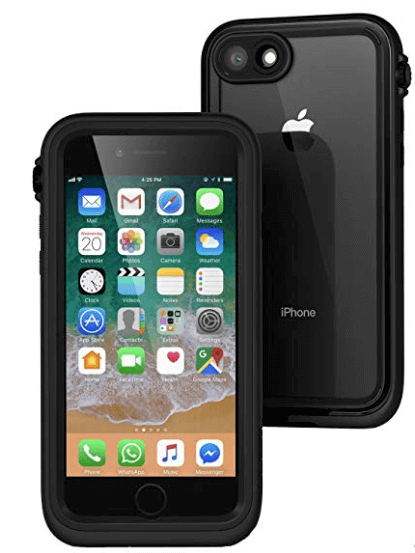 But if you simply want a case to place your phone in when you go out for specific outings, a choice like the Pelican or the Kona Submariner is probably more appropriate. The last factor I’d recommend considering is how easy it is to still use the phone once you put it inside the case. From experience, I know that I use my phone every day while it’s inside my Lifeproof case. I can’t even really imagine using it without the case on it. On the other hand, I can’t use the phone at all when I place it inside my Pelican Micro case, but that’s not really the purpose of that case. If you want to maintain functionality of your phone while protecting it from the elements, you’ll want to look into the experiences of others with the specific case you’re interested in. Especially when you’re purchasing a phone case online, it’s super beneficial to take the time to read user reviews of the most popular waterproof phone cases to see how certain cases rank in the eyes of your fellow consumers. Do you have experience with any of these waterproof phone cases? If so, I’d love to know which you’ve used, what your favorites are, and what you’d do differently if you manufactured your own waterproof phone case. If you’ve compared any of these cases to others that I didn’t mention in this post, I’d love to hear about them! Also, if you decide to make a purchase a case from Lifeproof, Pelican, Catalyst, Ounne, or Kona after reading this review, I’d love to know how you like whichever cases you choose after you’ve had a chance to put it to use for a few trips or travel excursions! Feel free to reach out to me directly (email below), or share your latest adventure or backpack by tagging @thebackpackguide on Instagram! You Must Protect Your Phone! This is a nice product review for waterproof phone cases. I love kayaking during the spring and summer season so a waterproof case is a must. I currently have a seperate waterproof case that is much like the Kona, but part of it broke with the sealing lock tab missing so it is time for a new one. The Kona is something that I could afford for sure too so I have it added to my amazon cart. I love hearing that! And that’s exactly why I included the Kona in my review. While folks that spend almost every day over the summer on the water should look into a case like the Pelican Micro, the Kona is perfect for casual kayakers that want to bring their phone so they can capture the beauty of their favorite kayak locations! This article of the best waterproof phone cases was amazing. I can see you spent countless hours researching and writing this post. 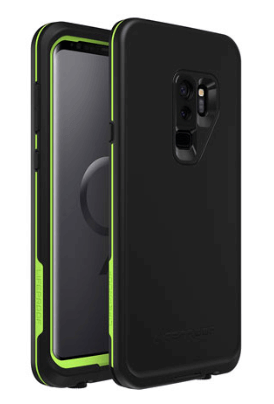 I’m going to check out the Catalyst Phone Case. Last year, I dropped my brand new smart phone into a glass of water. Don’t ask me how! Needless to say, it stopped working. Since then, I’ve realized that the money you spend on a waterproof case is an investment, or insurance program, to protect your cell phone. It’s much cheaper to buy a case than buy a new phone! Boom! That last sentence you wrote is the exact realization I had a few years back. For my business, having a quality smartphone has been a huge upgrade, but it was so necessary for me (both physically and psychologically) to purchase that insurance so that I felt safe bringing my phone along on all my adventures! I am Highly into the outdoors so I found your website great. Your outdoor gear section was great, I could find everything I need all in one place. The tips and trails section was also great and I loved your trip reports. hope you come out with some more soon. Thanks, and I’m glad you found it a useful resource! I’m producing new blogs weekly, and if you’re interested in videos too, you should check out my Youtube channel! I really like the fact that you’ve tried and tested the first few phones that you’ve reviewed. For me it carries more weight and authority which would in turn convince me to actually try the product out.Your suggestions of where and how to attach the phone so that you can still have peace of mind whilst Kyaking is a bonus too!My burning question with all of these enclosed casings/cases, is do they ever heat up because the phone is now enclosed? I found that with some of my earlier phones and was wondering if this issue had been addressed by phone makers worldwide.Looking forward to your reply. That’s a great question! I’ve found that some of the cheaper versions to heat up and cause condensation inside the case if they’re exposed to direct sunlight for too long. While I do like the convenience of attaching the Pelican Micro to my kayak seat for shorter trips. I usually will store it inside another dry bag or in a location that’s free from direct sunlight if I’m going to be out for hours at a time. Thanks for sharing your review on waterproof case. I have been thinking that soon something like this will be launched. The different types of waterproof cases are nice, this will add more protection to our smart phones from being distributed. I think I will go for the life proof but my question is their prices are not included. Thanks alot. Thanks for your comment! Click the link underneath your preferred case to view on the maker’s website. That’s where you’ll find the price! Hi! I’m an outdoor guy. I work inspecting oil wells and oil spills and creating maps of these events. I also love to go hiking and enjoying nature. So with all this outdoor activity you can imagine I have broken quite a few phones. I can directly relate to what has also happened to you during the past five or six years. But reading your post, I really liked Kona Submariner. I think it’s the ideal solution for me. I’m thankful for your recommendation. And I don’t know how I have spent all this time without one. I hope that your mapping helps us understand how to prevent future oil spills! (Guessing that’s probably one of the motivators) I’m glad you found the Kona desirable and it’s precisely why I included it in the review. In your line of work, though, it might be helpful to consider a more ‘Lifeproof‘ solution!